This weekend I spoke at Blog Camp in Birmingham about tips for vlogging. At the beginning of the year I set a personal goal that I wanted to speak at a blog conference, and for me it was an amazing experience. Next time I will try not to squeeze so much in, and hopefully I won't run over! I spent the morning feeling really quite nervous, but reassuring myself that nerves are good! They definitely helped when it came to my talk. I went to the pro blogging session which I thought was incredibly useful and I really like the idea of a sliding scale for payment. I have generally stuck to my rates and not really accepted much lower before. I also went to the product photography session which was very informative. For those of you who missed my session, you can see the slideshow here. Below you will also find a write up of my slides, which goes into more detail than the actual slides themselves. Vlogging can add a more personal element to your blog. People watching your videos as well as reading what you write can make you more relatable. However, make sure that you only vlog because you enjoy it. It is far easier to create amazing content when it is obvious that you enjoy the videos you create. Before you begin vlogging, think about whether or not you want to feature your children and document their lives. It could have a negative impact when they are older. Another thing to think about is to be prepared for mean comments and criticism. Certainly in my experience YouTube viewers can be particularly nasty. Well this is pretty obvious! You need either a camera or your mobile phone (I film using my mobile currently due to not owning a better camera). The video quality on a mobile phone can be fantastic. You could also do with a tripod or something to put your camera or phone on. I use an elastic band to attach my phone to my tripod (very high tech)! In terms of editing, you will need something to edit on (this could be your phone or a computer) along with something to edit with. Editing software ranges from free (Windows Movie Maker/iMovie) to paid for (I use Adobe Premiere Pro but there are many other sofware options available). You don't need expensive equipment though. You can use things around your house to pop your camera on to film if you haven't got a tripod. You can also use tin foil to create a reflective light screen. If you want to film moving time-lapse clips then you can use an egg timer and a few other bits. Have a look at the picture below. 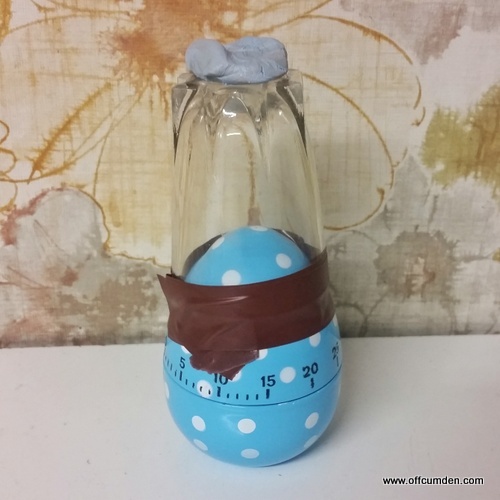 I attach a glass to the egg timer and then a blog of blutack to the top of the glass. You can then pop your camera on that and as the egg timer moves around your camera films. It creates a really nice effect when you speed it up. You can see an example of it when we are eating dinner on Christmas Day. Make sure your camera is filming in landscape mode (turn your phone on its side) and ensure your camera is set to film in widescreen if possible. This means that there are no black bars around your video when you edit and upload it to YouTube. Think about sound. Invest in a clip mike if you can. Make sure you think about the sound around you too. It's all well and good filming an amazing chat to the camera when you are outside and it's windy, but no-one will be able to hear it. Good lighting is also essential. Make sure you are well lit when you are filming. If that means buying a lamp to film when the sun goes in then so be it. Relax as much as you can when you film, it will be obvious if you are not relaxed. Breathe. This might sound stupid, but if you speak too quickly you forget to breathe regularly and you then get out of breath! Pretend you are talking to your best friend. It makes it more natural to chat to a camera if you pretend it is someone you would talk to about such things. If you feel shy or uncomfortable about filming in front of the camera then copy Beyonce. She used to bring out her more confident alter ego Sasha Fierce when she performed. It gave her the confidence to get up on stage in front of people. This is probably one of the most important elements for attracting new subscribers and views. Ensure that you have clear and consistent branding with your icon and banner. Thumbnails are incredibly important. They are the advert for your video. They are the one thing people will see before deciding whether or not to watch that video. Make sure you use a customised thumbnail (you can do this in Canva or PicMonkey type sites), have text and a person if possible. It helps to make it enticing for others. Another incredibly important element is to ensure that your title of your video is optimised, along with the description of your video and the tags you choose. Set up a welcome video on your channel which is around one minute long. Explain what your YouTube channel is about and what kind of things viewers are likely to see. The featured channels part of your YouTube channel is there for you to promote similar vloggers and their channels. Add an endslate, outro or card to the end of your videos. This can influence what your viewers watch next. If you feature your previous upload or a relevant upload. An endslate is an advert for the other places people can find you. Copyright can impact on what music you use on your videos. If you want to use current popular music, then you can check YouTube's list of restrictions for that music here. This explains what you can and cannot do with your video if you use it and which countries your video might not be viewable in. The main point to mention is that if you use music which is copyrighted and doesn't have a creative commons licence then you won't be able to earn money from that video. YouTube editor music library has a large selection of music which you can choose from, download and use free of charge. Make sure you credit the artist whose music you are using. Check the audio levels and make sure they are loud enough before you upload. Most editing software will let you increase the audio level, but you can also download Handbrake which also enables you to increase audio. Have a look at my video below to see my top ten editing tips. Before you press publish on your video, upload it and keep it private or schedule it. That way you can optimise your video with the the keywords and thumbnail you want. Once your video is uploaded, make sure you promote it. YouTube index your video in the first 48 hours and are more likely to use it as a recommendation if you have good interaction on it. Add it to a playlist in your channel. it helps people to find it and if they watch your whole playlist then you will be benefiting from their watch time. Think about the action you want a viewer to take when they finish watching your video. YouTube analytics provides vital information about who is watching your videos, how old they are, where they are from and how long they are watching them for. Make sure you review your analytics regularly. It then means you can tailor your content to your viewers. Longer watch time does not necessarily mean that you need to make longer videos. Ensure you have engaging content and make videos that your viewers want more of it. If you want to learn more, I would suggest taking a course through the YouTube Creator Academy. These go into great detail about YouTube and how to maximise your channel. Once my session was over I could fully relax, and I attended the writing session with Fiona, a former BBC trainer. In the afternoon break I made the most of the biscuits and waffles on offer! Huge thanks to Sally and Tots100 for inviting me to speak. I had an amazing time and benefited hugely from listening to the other speakers throughout the day.